I like to begin the week on an upbeat note, but this morning, I'm sad. As a child, I always knew that my father's mother had been adopted. She wasn't adopted as an infant, so it was no secret. The earliest census that I have found shows her to be living with her adoptive parents at the age of 5. In the earliest picture I have of her, she looks to be possibly 3 or 4. The story was that her biological mother died in a mental hospital. Now I know that the story was true. Yesterday afternoon, I found her death certificate, she was only 40 years old and it says that there was some type of damage to the brain as well as a gastric ulcer. Who wouldn't have an ulcer living in a mental hospital, especially in those days? Her name was Katie. Even worse, the certificate says that she was divorced. As I researched her husband, I found that he had been married prior to their marriage and there were a number of children. What happened to this family? He then married Katie and had 4 children with her. What I have always thought was that due to the time frame of my grandmother being adopted, her mother may have suffered from postpartum depression. It was common in those days for women who suffered from postpartum to be placed in a mental institution. Her 2 sons ended up in an orphanage in Houston where they were labeled "inmates." Children who were only 9 and 12 years of age labeled "inmates." The youngest of the 2 died when he was only 12. What could have happened to him? Quite honestly, I don't want to know. Katie died on November 10, 1928 and was buried on November 11th. Just thrown into a grave. Most likely, there was no one there to mourn her passing. Her husband married soon after their divorce and went on to have a number of children with his 3rd wife. He abandoned his family, and then just went on to have another. What shocked me was to find out that Katie is buried in Houston in a cemetery that while living in Houston, I drove by each and everyday. It was just blocks away from where I lived. Since this is still all so new to me, I am trying to process the information. When I was a child, my grandmother showed me a picture and told me that it was her biological mother. The woman in the picture was so pretty. Sadly, that image is most likely lost to time. But, Katie is now in my heart, no longer abandoned. On my next trip to Texas, I will visit her grave site, pay my respect and say thank you. She suffered greatly, but because of her, I am here and I have a lovely life that I share with a husband who would not abandon me if I lost my mind. 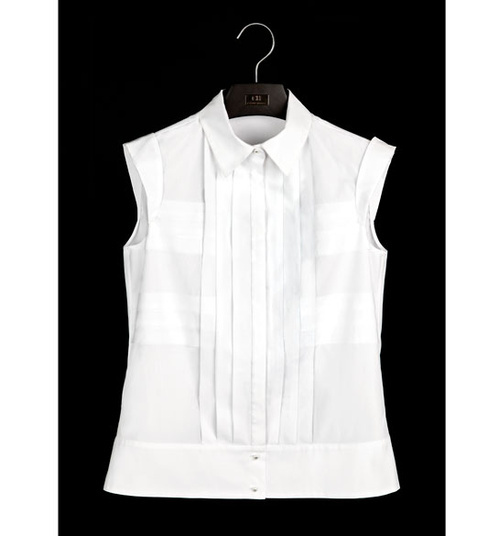 When I was doing the research for last Monday's Inspiration post, I saw the Carolina Herrera white shirt collection. 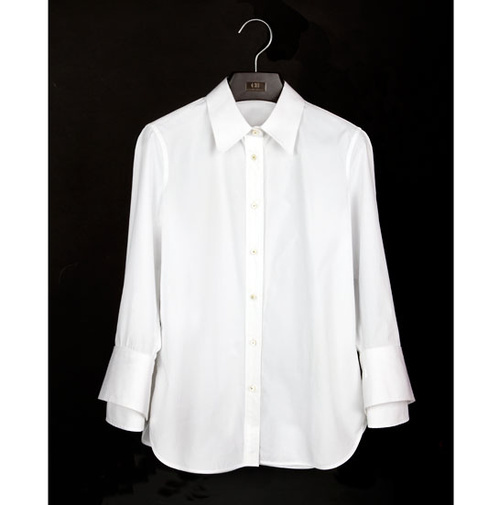 The white shirt is her signature garment and she wears it so very well. 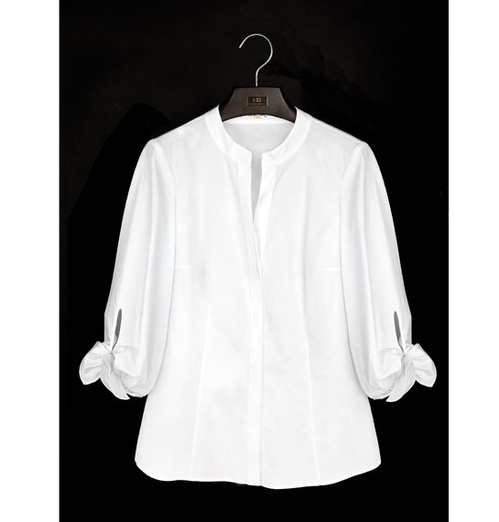 Carolina began doing a white shirt collection in 2013. I've attached the video below where she and her daughter talk about the collection. It's only a little over 3 minutes long, so not long and well worth the time spent. Below I've posted shirts from that collection. Take note of how well they would fit into a wardrobe today as they did in 2013. Truly timeless. 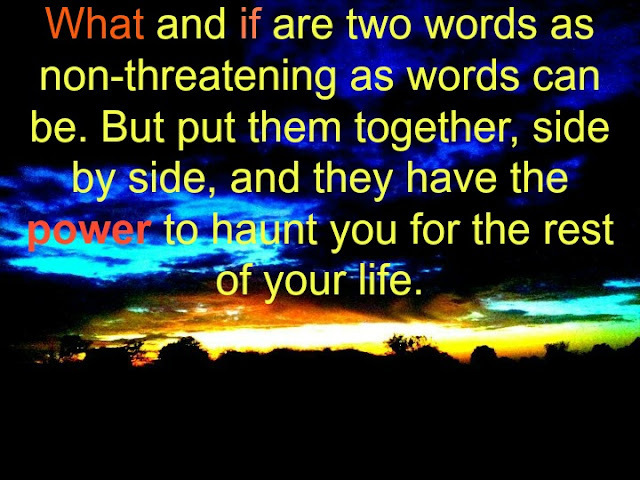 This is by far my favorite. 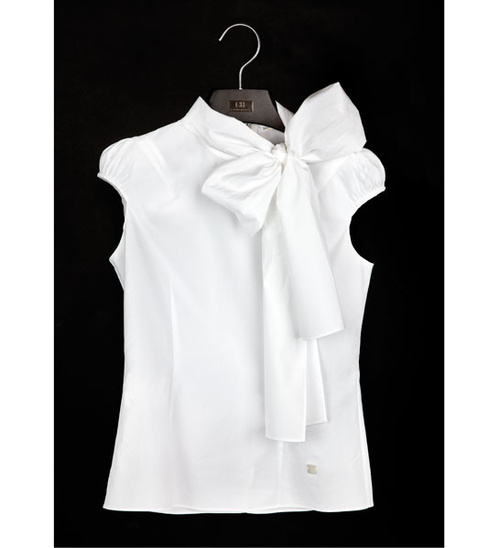 Love the asymmetrical front tied neckline and the sweet sleeve treatment. 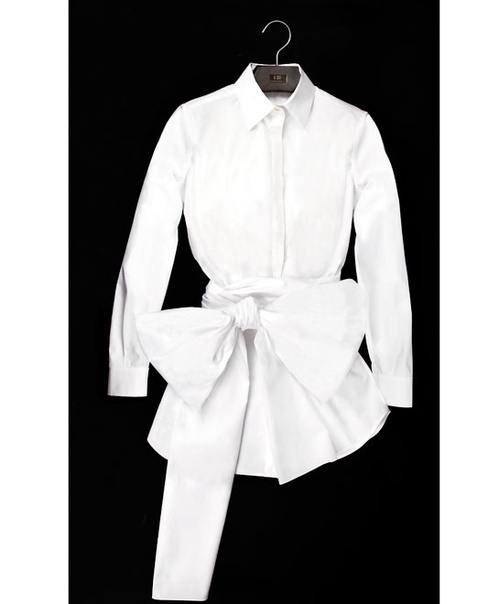 Since 2013, Carolina Herrera has been doing a collection dedicated to white shirts. You can see the 2017 collection HERE. The only issue with a white shirt is that it needs to be white. Sadly, this is not a garment that you can wear for years on end as they tend to become yellowed, or at least lose their vibrancy when washed repeatedly. So I would recommend dying the shirt after a season or 2 if you like the style and then making something new. 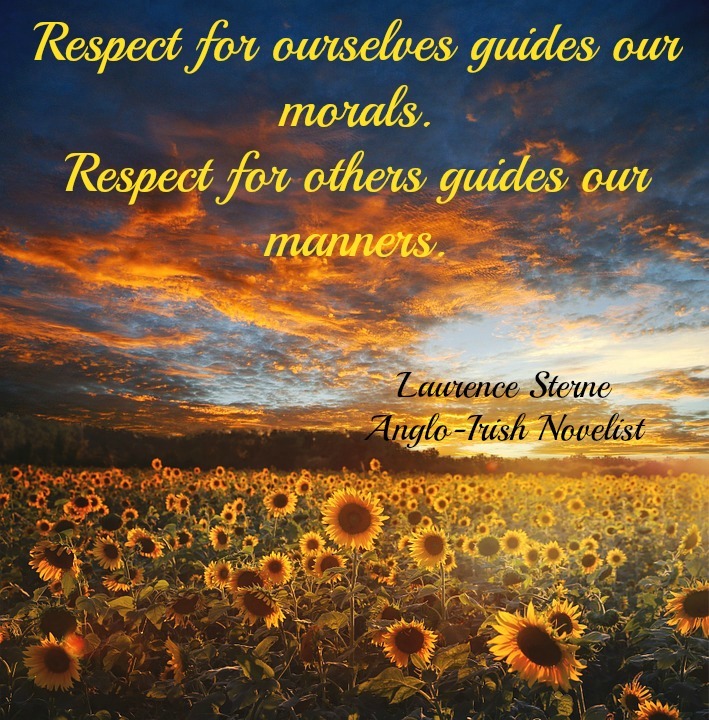 Enjoy this last day of July. What a week, a week filled with good things, bad things, sad things, and very little blogging things. But, the good out weighs the bad, and the bad is behind me, so happily, I move on! Another favorite item, other than soups, are fun salads. I have fallen in love with fennel! Earlier this past week, I had purchased fresh fennel. 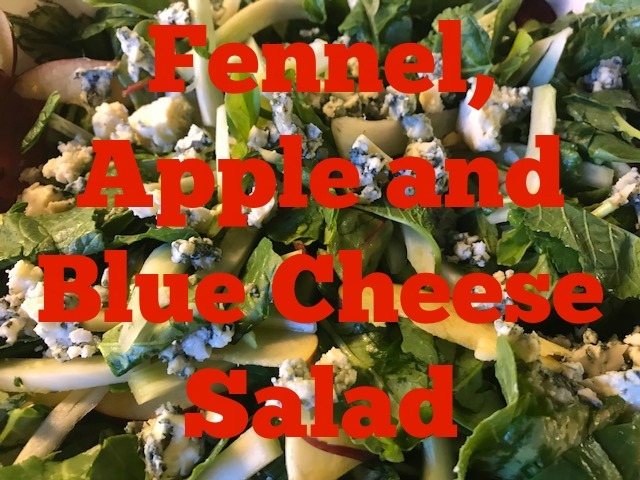 As I was looking in my refrigerator, thinking about what I might like to make, the thought of pairing an apple with the fennel and then tossing it all with mixed greens sounded perfect. I placed about 3 heaping cups of mixed greens in my salad bowl, and topped them with a thinly sliced red delicious apple. I then added 1 bulb of fennel which I sliced. Please do not follow my lead, chop the fennel, it'll be easier to eat and much more enjoyable. I then added 1/2 cup of crumbled blue cheese, and 1/2 cup of toasted chopped pecans. Now, the dressing I made, was simple and fabulous. A friend gave me a bottle of blood orange olive oil, and a bottle of tangerine balsamic vinegar. I used 1/3 cup of the oil and 2 tablespoons of the balsamic vinegar, whipped it together and then poured it over the salad. The nice thing about the oil and vinegar is that they are available to order. For those of you who live in or near Chicago, they have stores on Wells St. here in Chicago, and another in Evanston. If you would like to order the oil and vinegar, you can find them HERE, and HERE. Well worth the investment. Whip together, pour over salad, toss and serve. A friend of mine was so inspired by a past Monday Morning Inspiration post that I did on Carolina Herrera that it prompted her to recreate one of the dresses. She did a beautiful job, and I think it is now one of her favorite dresses. Nice! My friend's excitement over her dress has prompted me to pay a little more attention to what Carolina Herrera is doing. This is the time of year that many of us are growing a little weary of warm temperatures, but are not quite ready to give up bright colors and floral prints. 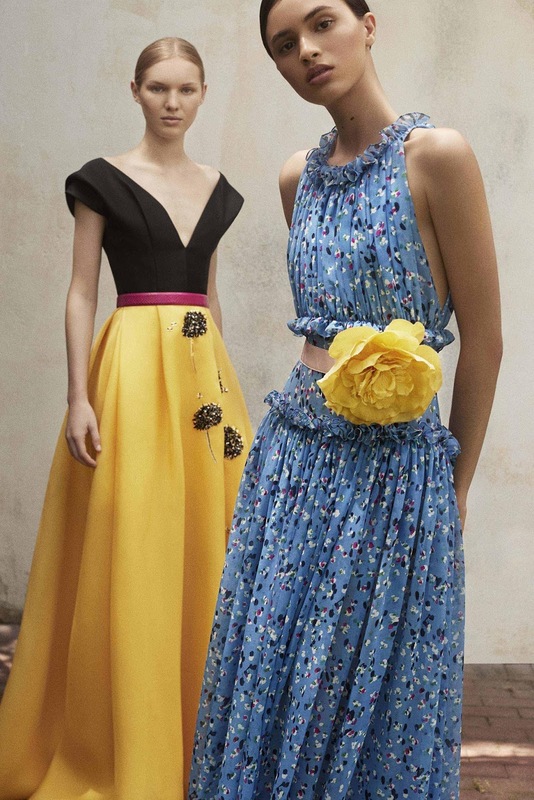 On a recent visit to Carolina Herrera's website I found this absolutely beautiful video that showcases her 2018 resort collection. The fabrics and colors are so dreamy! 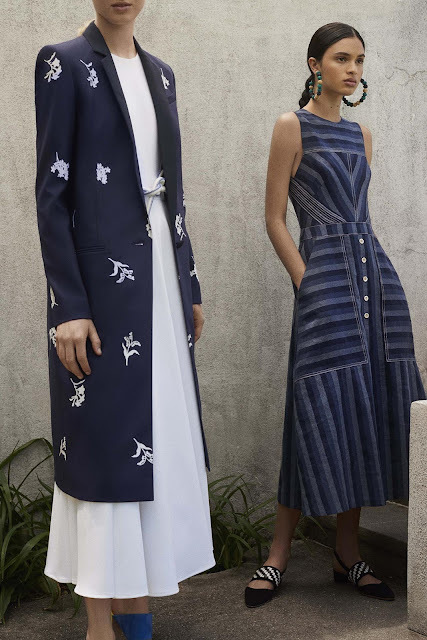 The video was shot at her Venezuelan home which been in her family since 1590, and the garden was her inspiration for this collection. It's only a little over a minute long, so it won't take much time. By all means, PLEASE take a look as the photographs do not capture the beauty of the garments the way that the video does. Carolina Herrera New York - Resort 2018 BTS from Carolina Herrera on Vimeo. 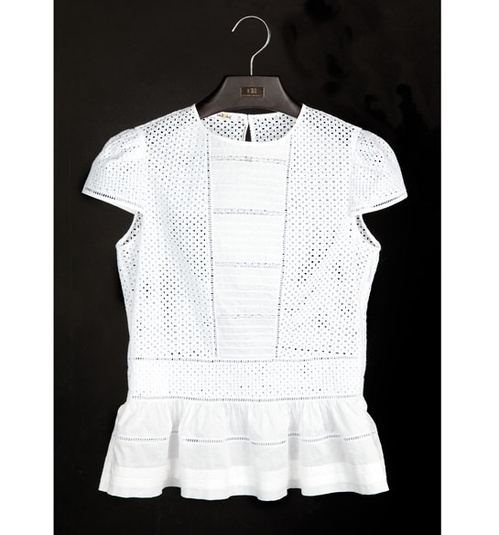 Carolina expresses that the collection is fun, fresh, and effortless. 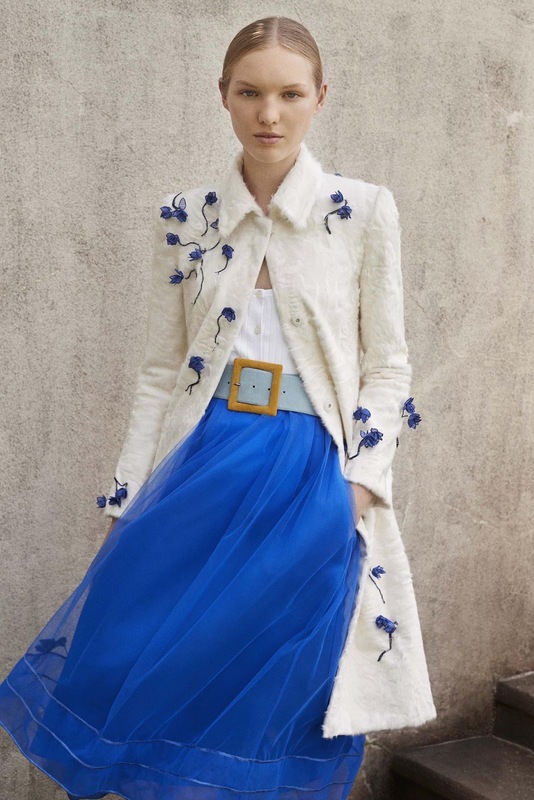 I love how the pieces work together, and the 3 dimensional floral appliques and embroideries. This is a dress that we have seen in the past as more of an asymmetrical bandage dress. I love the added circular skirt. The longer jackets are lovely and the movement of the stripes makes the dress especially interesting. 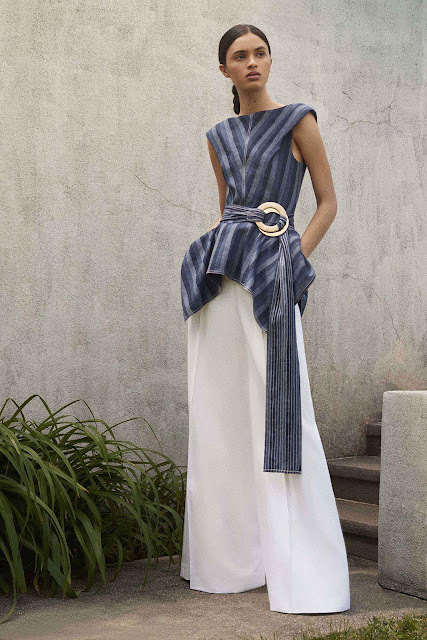 I love everything about this look, the wide leg pants, the interesting play of the stripes in the peplum top, and the simple, but dramatic belt. Fun poppies really add whimsy to the garments below. I hope you have been inspired, I know I have!!! 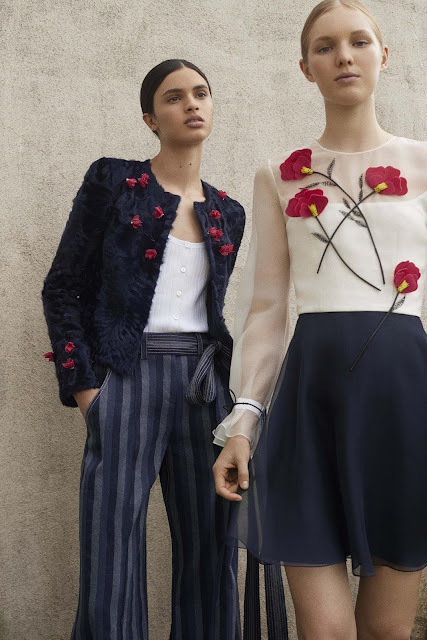 If you would like to see more from Carolina Herrera, you can find her website HERE. Have a wonderfully, colorful week! Whether it's spring, summer, fall, or winter, I love to eat soup, and my refrigerator just isn't quite right if I don't have a soup that I can grab and warm up for my lunch. The soup that I am sharing today has a bit of a twist to it. You can tweak it if you're a little afraid of the spice. First, I began with these wonderful boiler onions. They are typically used in dishes like stews, or with other boiled vegetables, as they are small and mild. 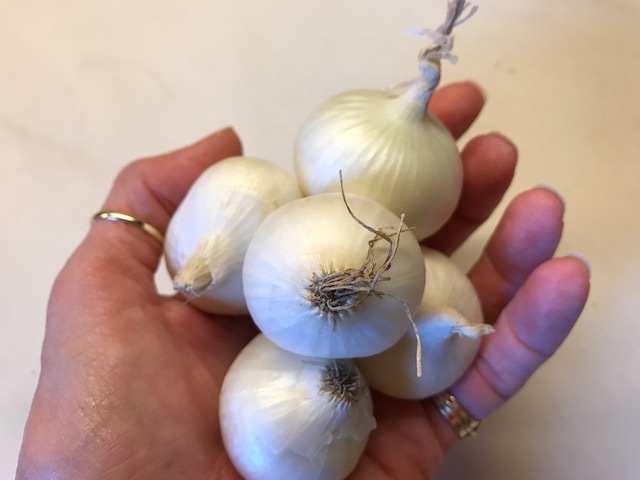 If you can't find boiler onions, a nice white onion will work just fine. I then came across a beautiful orange bell pepper and my favorite, a habanero pepper. Both were seeded and chopped. Like I said, if you are a little afraid of the heat from the pepper, you can just omit it. While habaneros are hot, they also have a sweet taste. You could also use just half, or even a quarter. The peppers and onions were added to 4 heaping cups of sliced carrots, 3 cloves of garlic, a tablespoon of chopped ginger, dried cilantro and ground coriander. The final little surprise ingredient is 1 chopped Granny Smith apple. The apple is both sweet and tart and the mixture of the flavors works beautifully with the habanero to reduce a little of the spice and yet allow for the flavor. Once the vegetables are tender, the soup is pureed and a cup of coconut milk is added to the mixture resulting in a creamy, spicy, sweet soup. To enhance the flavor a little further, I added a dollop of fresh made cilantro pesto. If you are vegan, just eliminate the pesto, or make the pesto without the Parmesan cheese. You can find the recipe for the Cilantro Pesto HERE. The recipe for the soup is below and you'll see that I have added a printable tab to the recipe. Bring all ingredients except the coconut milk to a boil. Reduce heat and cook until vegetables are tender, approximately 20-30 minutes. Using a blender, or hand held blender, puree the soup until creamy. Add coconut milk. If the soup is a little too thick, add additional vegetable stock. Simmer the soup on a low flame until coconut milk and any additional stock has warmed. 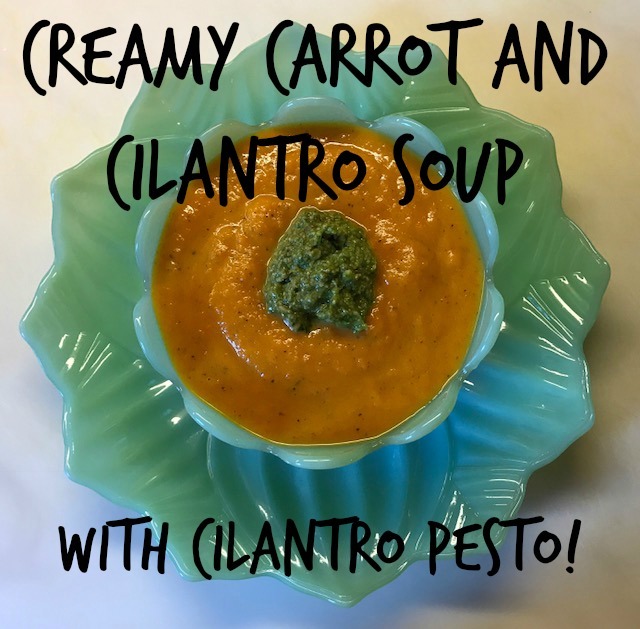 Serve the soup with a dollop of cilantro pesto. I am so very happy to finally be back with an all new episode of Sewbussted's Material Witness!!! 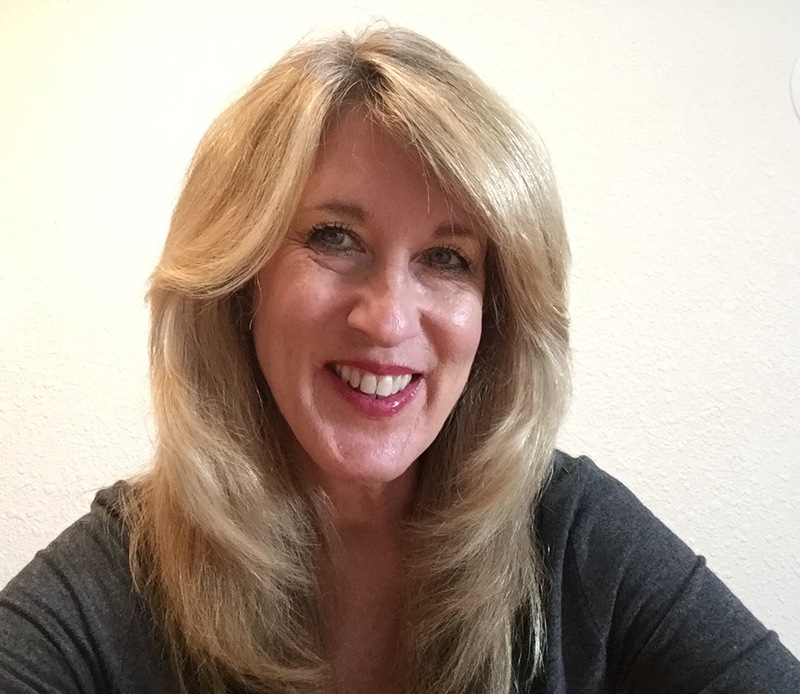 There may be a few of you who have thought, "I have a great idea that I think should be published," and yet, you aren't sure just how to take the first step. 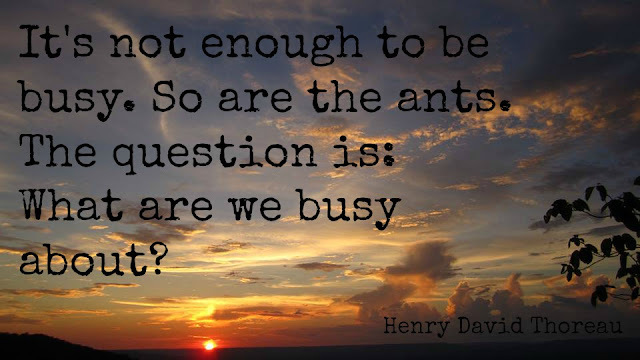 And then there may be others that would just like to know what goes into the process. And 2 fabulous knitting books. I had a wonderful time talking with Laura. She's very inspirational, and I think that if you've thought that this is something you can't do, Laura will prove otherwise! Although Laura's quilting books are out of print, you can find them all HERE at AbeBooks. It's a wonderful website that I found where the prices are great, and the shipping is free!!! You can also find her knitting books there, but keep in mind that they are used. Of course you can purchase a brand new book HERE at Amazon. The book that Laura mentions reading before she began her publishing journey is How To Write a Non-Fiction Book Proposal. I suggest looking into your public library for this book. Laura talks about writing articles for magazines as a way to get your feet wet before jumping in to an entire book. You may remember that Ellen March, editor of Sew News invited anyone who would like to submit articles. You can find that video HERE. I hope this has been helpful to some and enjoyable to others. I know I had a great time! Be sure to stop back by next week as I have a fabulous surprise for our next episode of Sewbussted's Material Witness!!! Last Monday I announced the winners of the new Islander Fast and Fabulous Jacket Pattern. Sadly, Karen Roop was the only one of the 3 winners to respond :( So one's loss is another's gain! Congratulations ladies!!! Be sure to email me at sewbussted@yahoo.com ASAP with your mailing info. I've decided to make 2 more jackets. After I made the first, I decided that I really would like one made in leather. But before I get to that one, I would like another that will be great for summer, especially in air condition. I get so cold sometimes. I found a lovely piece of denim that actually has a little linen in the fiber content which softens the denim beautifully. I also purchased a light blue woven cotton to pipe the jacket and bind the seams. The denim has the traditional twill weave, but like I said, softer with the addition of the linen. The lighter blue cotton has a matching diamond of the blue denim in the weave. I love the first jacket I made, but I wanted to step up the construction a bit by binding the interior seams. Besides that, jackets look so lovely when you take them off and there's something interesting on the inside that catches the eye. Once I get started on the jacket, I'll show you a fun stretch cotton I purchased for pants. I think it will work well with the denim. Just a reminder that Janet has graciously offered a 20% discount to anyone who comes by the blog. Just use the promo code SEWBUSS at checkout. The discount is good until Saturday, July 22, 2017. You can find the paper pattern HERE, and the PDF pattern HERE. 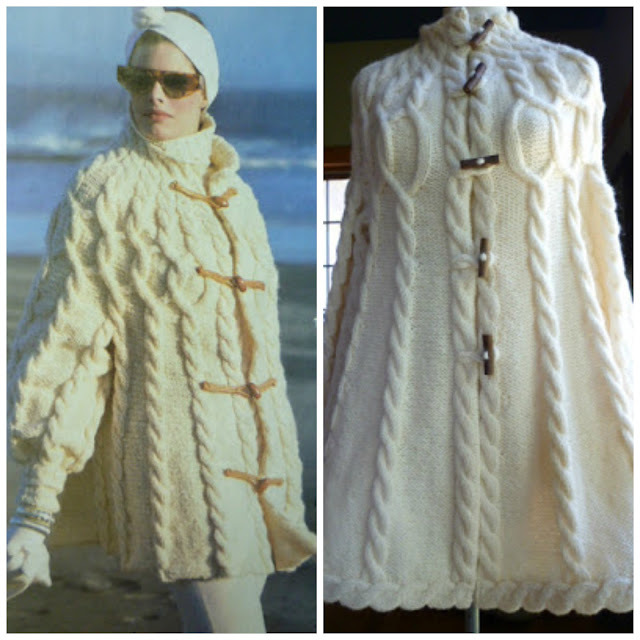 The sweater is actually featured on the cover of the Rowan Magazine Number 46. A number of things caught my eye. First of all, the cable around the hem of the tunic. You may remember the sweater I did a few years ago, I'm a nut for cables!!! I also loved the simplicity of the pattern. I think that the stitch throughout the tunic is a seed stitch. I always have to look up the names of stitches. Anyway, it's a very simple to do stitch and perfect for an easy knitting project that will also travel well. 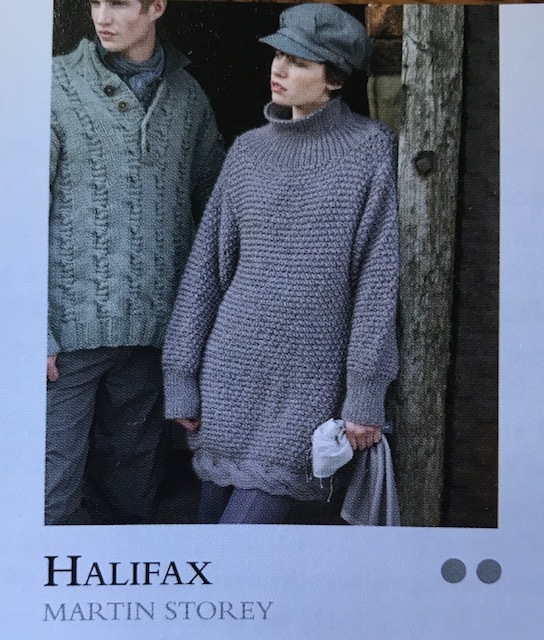 As you can see below, the design is by Martin Storey and it's called Halifax. And last but not least, I had the yarn. Lorna's Laces is based in Chicago. The owner is so very gracious about opening her warehouse and hosting an ends shopping day. She will usually do a wonderful presentation on her process of hand dying her yarns. Be warned though if you do attend one of her sales, it's quite tempting to walk out with bundles! I was actually fortunate enough to be able to purchase an entire bag of the yarn I'm using for the sweater. 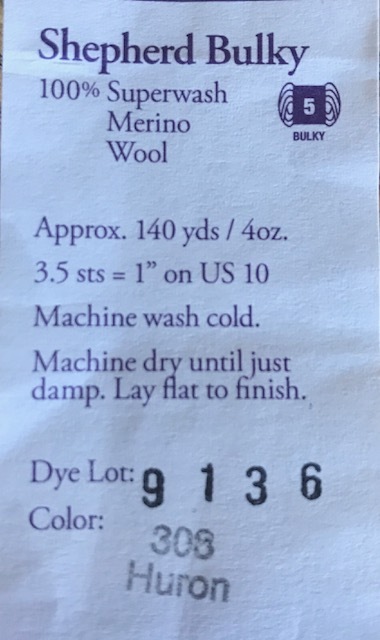 Below is all of the yarn info. 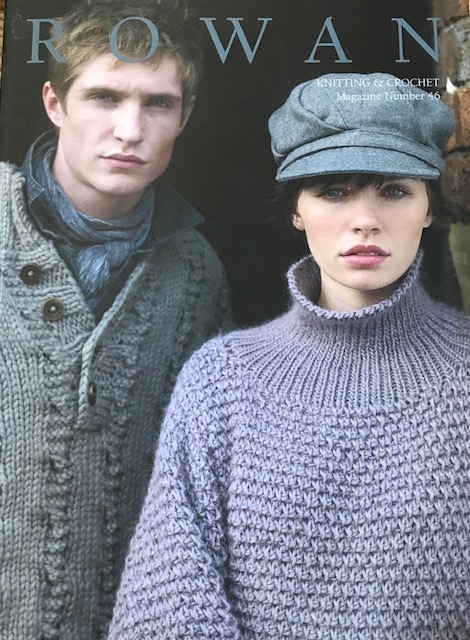 The Rowan yarn that was used for the sweater is Cocoon. It's also a bulky yarn and has the same stitch per inch as the Lorna's Laces Sheperd Bulky. You can find other colors of the Lorna's Laces Sheperd Bulky HERE at Love Knitting. I wasn't sure how the color combination would knit up, but I'm quite happy with how it is turning out. I'm especially excited about getting to the point that I can add the neckline. I think it will come together quite nicely.